Includes metal case, art book, anime DVD, more. 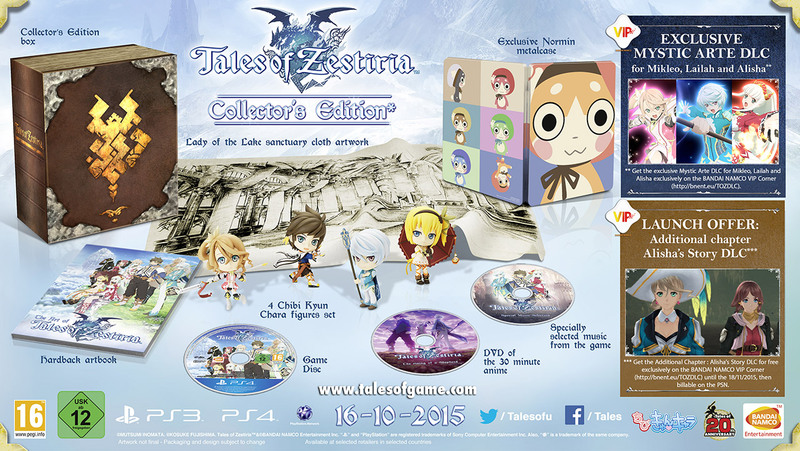 Bandai Namco has announced a collector’s edition for Tales of Zestiria in Europe. All standard edition copies of the game will include the “Exclusive Mystic Arte DLC for Mikleo, Lailah, and Alisha,” and all users can get the “Additional chapter: Alisha’s Story DLC” for free until November 18. “As we announced during our Level-Up event, 2015 is full of surprise for Tales of fans. Bringing Tales of Zestiria to PlayStation 4 and PC was our first step towards the celebration of the 20th Anniversary, bringing an all-time favorite to PC was the second step! We are working to do more for Tales of lovers, as they are among the most passionate and loyal gamers around the world,” said Bandai Namco Entertainment Europe VP of marketing & digital Herve Hoerdt. Tales of Zestiria will launch for PlayStation consoles on October 16 across Europe, the Middle-East, and Australasia; via Steam in the Americas and Europe and for PlayStation consoles in North America on October 20; and in Brazil on October 23.